Mix all the lamb marinade together. Add in the lamb cutlet and let it stand for 35 minutes in the chiller. Soak the white & black fungus overnight to soften it. Blanch the white & black fungus and spinach separately. Set aside. Preheat oven to medium-high heat at 200oC. Sear the lamb racks on the hot grill for 1 minute. Turn and sear the other side for another minute.Place in the oven for 5 min. Remove when the meat is done. 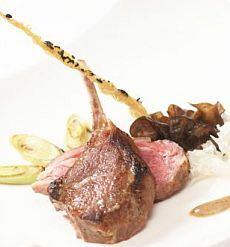 On a serving dish place the blanched spinach and fungus top it off with the lamb cutlet. Drizzle the Mongolian sauce over the lamb. Garnish with deep fried sesame bean curd sheet, serve hot. Melt butter in a saucepan and put in all the ingredients. Simmer till the sauce thickens. **Crispy sesame bean curd sheet is prepared by coating one side of a softened bean curd skin with a thick corn flour and water mixture sprinkled with black and white sesame seeds and deep fried in hot oil.